Many teens are advised to wear dental braces for oral health. Unfortunately there are myths and rumours surrounding dental braces that can be off putting. If you are thinking of wearing dental braces but are unsure of the facts, then read on for answers to frequently asked questions about dental braces. widen the palate or jaws. shape the teeth and jaws. Braces apply continuous pressure to move teeth in a specific direction to bring about the right alignment and bite. The treatment period lasts from as little as 6 weeks to three years, depending on the level of movement required and the type of brace that is used. Braces are custom-made appliances that use applied pressure to straighten your teeth and correct your bite. While some practitioners still favor metal braces as the most reliable, new materials and other technological advances have made smaller, less noticeable braces available. Instead of metal, you may be able to wear clear or tooth-colored ceramic braces or removable invisible aligners. 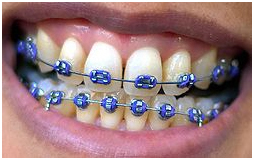 Stainless metal braces : - for those who are not allergic to metal. They are popular for their ruggedness and economy. Ceramic braces : - made of a high-tech glass-like composite material and are quite expensive. They are quite strong and resistant to most stains, excluding those caused by foods, coffee, Coke, curry, smoking, etc. Sapphire Inspire! brand braces : - made of pure monocrystalline sapphire. They are very translucent, strong and resistant to most stains, excluding those caused by foods, coffee, Coke, curry, smoking, etc. They too blend in with the teeth and are not noticeable, especially if you have white teeth. They are quite expensive compared to other braces. Traditional silver braces : - the most common and most popular style of braces, with brackets that are top in design and functionality, resulting in the most efficient and precise movement of the teeth. They can also be decorated using color combinations and patterns as preferred by the user or using computer-generated templates. Gold Braces : - gold-plated braces that also come with gold archwires. They are mostly chosen for their aesthetic appeal. Invisalign Braces : - invisible braces are ideal for those who do not have severe malocclusions. They comprise of custom-made treatment trays that have been computer-fabricated according to the jaw structure. They are almost invisible to the eye and bonded to the front of the teeth. They do not cause irritation to gums and are stain resistant. Lingual braces : - these are attached to the back surfaces of the teeth; they are traditional metal braces with wires but they are not visible from the front surfaces of your teeth and so have the advantages of being invisible to everyone else. Read more about lingual braces. Bands : - cover most of the teeth with metal bands that wrap around the teeth. Inman Aligners : - the Inman Aligner is a newcomer to the UK market; it achieves rapid teeth movements and is used for problems related to minor movements of the upper and lower front teeth. Friction-free Damon braces : -Damon braces offer a lower-friction solution to teeth straightening and boast faster treatment times than traditional metal braces. Read more about Damon braces. What is the procedure for placing dental braces? Initial consultation : - X-rays, moulds, and impressions of the teeth are taken to determine the problem and proper course of action. An etchant is applied to the teeth to be braced to help the cement stick to the tooth surface. A bracket is applied onto a tooth using dental grade cement. The cement is then cured with a light until it is hardened completely. An archwire is threaded between the brackets and attached with colored elastic or metal bands to help close open bites, shift the midline, or pull teeth or jaws strongly in the desired direction. The braces are adjusted at regular intervals to help shift the teeth into the correct position. 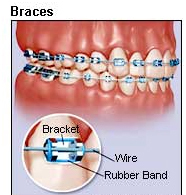 After they are adjusted, the colored rubber bands are removed. The arch wire is then taken out, and replaced or modified, and placed back into the mouth. New rubber bands are then fixed to the metal brackets. Retainers are worn once the braces are removed to prevent the relapse of the teeth, as bone and gums need additional time to stabilize around the teeth. The time period for wearing the retainers will depend upon the individual patient condition. They can be moved in and out of the mouth as required. Dental braces serve a variety of purposes. Most commonly dental braces are used to straighten teeth that have grown in crooked and/or align the upper and lower jaws. For some people this may be a strictly cosmetic procedure (they just want to have nice straight teeth), but others may get more medical relief. For example, sometimes when teeth are straightened and the jaws are aligned pressure is taken off of the joints that are located in the mouth and the wearer feels much more comfortable. The health of teeth and gums can also be improved when teeth and jaws are realigned to make better cleaning possible. What Happens After Dental Braces? When dental braces are removed, patients should continue to carry out a regular regime of tooth brushing, flossing and regular dental check ups. Throughout time, teeth may shift slightly but usually not to the point that further orthodontic treatment is needed. To combat this natural slide, patients may be advised to wear a retainer. These devices simply hold teeth in line while the mouth settles into these new positions. Retainers may be fixed or removable, and some patients may only need to wear them at night. Dental braces are a specific type of orthodontic treatment that can leave teeth and jaws straight and healthy when used correctly. For more information about your specific case, visit your dentist today and ask about the availability of dental braces in your future. Risks and limitations of orthodontic care : - Allergic reactions to the metal or latex. Increased risk in people with periodontal problems, such as people with type 1 diabetes, who are predisposed toward the breakdown of gum and supporting tissue, affecting the long-term integrity of affected teeth. Side Effects : - Immediately after dental braces are fitted there may be some discomfort. Shifting teeth and jaws as well as alien brackets can all cause discomfort, but there should be no real pain. Patients who experience any discomfort should report to their dentist or orthodontist immediately as adjustments may be able to be made. Who Can Wear Dental Braces? Dental braces are available to both children and adults, though evidence suggests that they work better in younger people. There is no specific age at which a child can begin orthodontic treatment, but there must be enough adult teeth available to work with before dental braces can be fitted. How can I brush with a regular toothbrush when I'm wearing braces? Turn the toothbrush at an angle (One brushing method is to place your brush at a 45° angle to the gum. Apply gentle pressure as you brush with a short back-and-forth motion, cleaning each tooth individually for about 10 seconds.) Brush over the front and back and chewing areas of each tooth Brush the lower teeth up and the upper teeth down. Brush your tongue and the roof of your mouth. Remember to brush the chewing surfaces of your teeth - and make sure you reach the teeth in the back, too. Finish by cleaning around your braces, brushing first from the top and then from the bottom. (Brush gently, being careful not to break or bend any of the brackets or wires.) Brush your gums as well as your teeth After brushing, be sure and look at your teeth very thoroughly in the mirror to make sure you have gotten rid of all the plaque on your teeth. Floss nightly after brushing to remove the plaque missed by brushing. Figure : Brush your teeth along the gumline! Choose a waxed floss and curve the floss around each tooth in a "C" shape. With dental floss wrapped around the tooth, gently move it up and down the side of each tooth, including under the gumline. Unroll a new section of dental floss as you move from tooth to tooth. Carefully pull waxed floss between wire and braces. Use a fluoride mouth rinse at least once daily to help reduce the risk of cavities. Braces aren't just for teenagers – it’s never too late to improve your dental health and beautify your smile. About 1 million Americans over the age of 18 wear braces. Your general dentist can help you determine if orthodontic treatment is the right option for you. Your general dentists may even be able to treat your orthodontic problems. You can also request an evaluation and receive treatment from an orthodontist, a specialist in diagnosing, preventing and treating improper alignment of the teeth. Tips : - Do not use toothpaste with whitening--it will cause discoloration when you get your braces off. Small circles are a good form, and spend at least 25-30 seconds on each bracket. There are these little things called Pluckers that are like floss on a teeny stick. They can be bought at most stores, so keep an eye out for them! Brush all your teeth; you don't want a white square left on the teeth you haven't been brushing. Get an interproximal brush; it is good for getting into the tight spots. Ask your orthodonist for one, or a place where you can find one.